Things we do for fun! Aside from Picnic Day, at UCDavis, which provides a breed exposition, we have also had some fun get togethers of Anatolians and owners from the area, with some owners coming from several counties away. 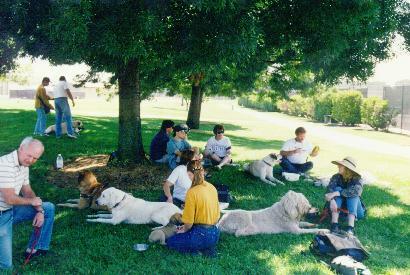 The group here includes the Murais, Eisenbergs (with Komondor), McKeons, Bensons, and Olivio Gomez, Ken Hamlet, Cindy Krek, myself. Not in this picture are Nikki Lugli, Nelda O'Hearn, and a few others. Sherry Benson with Kibar. 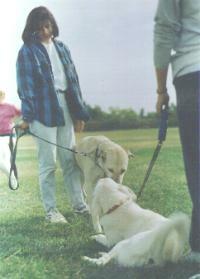 Susan Murai with Abby (down). Hugo Guzman with (fawn)Leo. 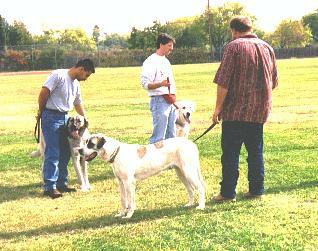 Anthony Benson with (white)Duncan. James with (pinto)Cana. 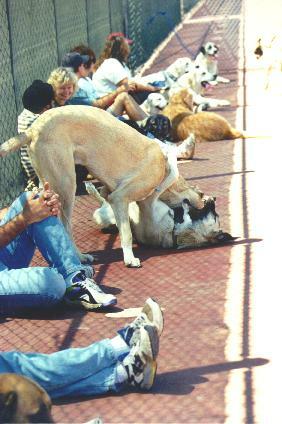 Eli(fawn) with Ken McDaniel, Moises Bedolla with Vahsi(blue), Annie(fawn) with Jim McKay, and Gus (3 months) sleeping in front of Sunny Goodier, and a red fawn ASD laying sorta in the foreground that I think Sunny was boarding at the time, and can't remember the name of right now. 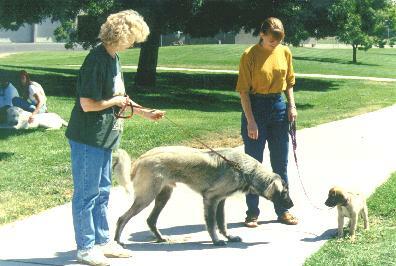 . .
Nelda O'Hearn with Jamie(grey, roughcoat) and Cindy with Zanzi(pup) getting acquainted. Resting in the shade of tennis court netting. That is Windy Springs Ian happily munching on the very willing and equally happy munchee, Semavi Chula. This page © by Janice Frasche All rights reserved. No part of this page; text, images or content can be used without written permission of author.